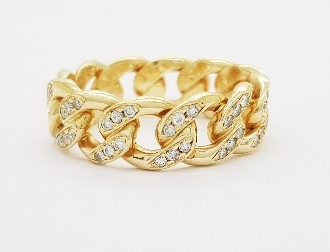 This ring has been handcrafted in 14K Yellow Gold to create the luxurious design of the popular and trendy Cuban Link Ring. The intricate link details allow this piece to make a bold yet elegant statement to compliment any outfit. A special touch of Pave set Diamonds give this piece an extra sparkle and makes this piece demand attention.